* Liftgate delivery is $100 additional. Shipping Is also available from West Coast Warehouses. Add $49.99 per unit for faster turnaround. It normally ships from MN. 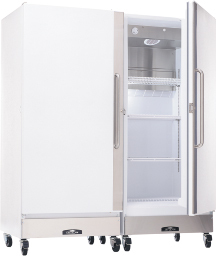 Arctic Air's Reach-In Refrigerators (Models GDR22CWR, R22CW) are are white poly-coated steel units that come in both glass and solid covered doors. All are NSF Level-7 Certified and equipped with the same high quality features and warranties as our competitions brands. Specify left or right hand hinging. * Liftgate delivery is $100 additional. Shipping Is also available from West Coast Warehouses. Add $49.99 per unit for faster turnaround. 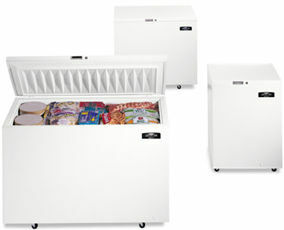 It normally ships from MN. .
Arctic Air's Chest Freezers (Models CF05, 07, 09, 13, 15, and 20) are white poly-coated units have a convenient temperature control and reach temperatures of -20 F. All have an environmentally friendly 134A refrigerant and have been tested and certified to ANSI/NSF Standard 7 for prepackaged foods. A simple manual water drain port makes defrosting easy. With two and a half inch wall insulation, our units are some of the most energy efficient in the industry. 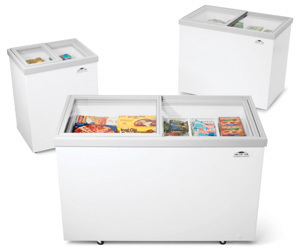 Arctic Air’s merchandising freezers (models ST05G, ST07G, ST09G, ST13G, ST15G, & ST20G) are designed to make easily and attractively display and sell frozen food and ice cream products. All models have a convenient, adjustable temperature control and will hold temperatures down to –18 degrees F on average. Pan Slide Kit: Racks hang from clips on existing pilasters. Kit contains two racks and four clips. 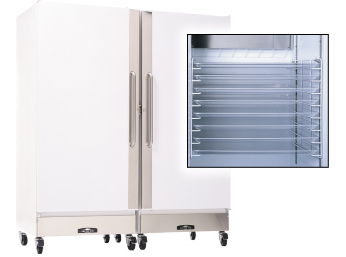 Accommodates up to eight standard 18" x 26" sheet pans at 2.5" spacing. For information on any of our 58,000 items, phone us, fax us, or use the link below to send us e-mail.